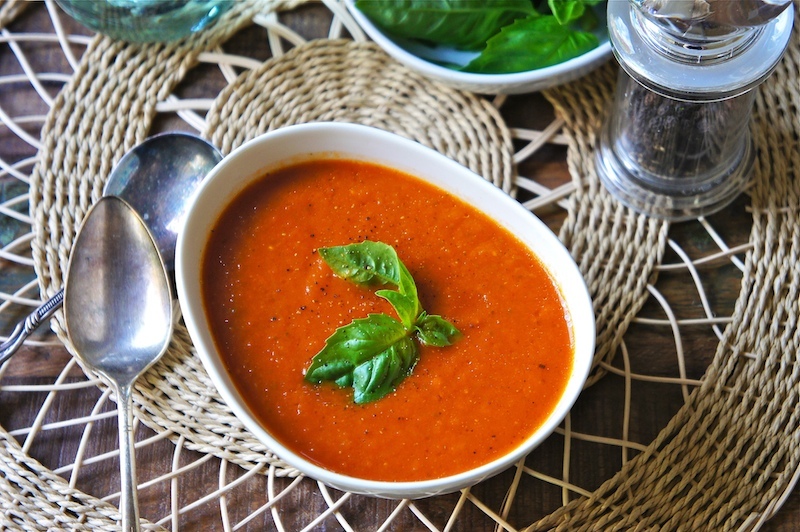 This delicious Tomato with Roasted Garlic and Basil Soup is made with just canned tomatoes, a few cloves of roasted garlic, onion, carrots, and lots of freshly picked basil. A healthy and yet tasty soup that's great just by itself or as a starter to any meal. Try it. Heat the olive oil in a large pot; add onion and carrot with a pinch of salt. Cook the mixture until soft and translucent but not brown in color. Then turn the heat on high and mix in chopped garlic, tomatoes, and basil. Sauté the mixture for a minute or 2, and add the chicken or vegetable stock. Then bring it to the boil, lower the heat and simmer for about 20 to 25 minutes. Allow the soup mixture to cool slightly before you puree it with a handheld blender. Bring the soup back to the boil and season with some salt and pepper. Serve warm with some freshly grated black pepper. The addition of roasted garlic to tomato soup is a really nice touch! I will give that a try. Lovely soup! I love combination of flavours and the vibrant colours!